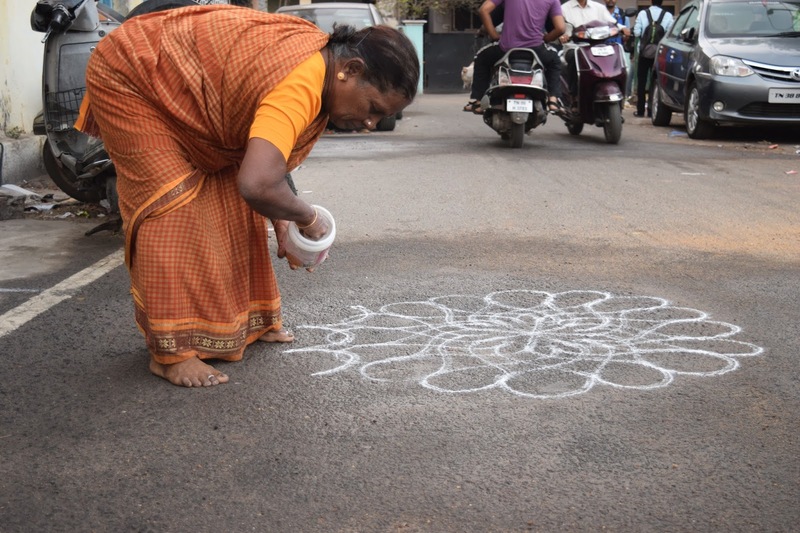 Of course, there are still many parts of Chennai where you can get to see people like her. But make sure you get there early in the morning! The advertisement bill catches the eye first. A patch of fluorescent colour on a drab wall in Errabalu Chetty Street, just where it meets Armenian Street. The bill advertises many things, each of which seem to mock the edifice it is pasted on. The locked door was certainly new, once. It may well have led into a 3-bedroom house. It is not difficult to imagine a 3-bedroom house with a balcony. There are several early 20th century houses nearby, with balconies overlooking the street. This could have been just one other such. But really, the brick wall behind the door and the window pane makes a mockery of the door itself. And a ghastly breach of security, one panel of the door has been broken up, providing easy access to the brick wall behind! Because today is the 120th anniversary of the modern Olympic games, here is a picture of a Chennai landmark that was instrumental in the birth of the Indian Olympic Association (IOA). Although India did not feature in the 1896 games at Athens, there was an 'Indian' who participated in the 1900 games in Paris. And then, for a generation, the Olympic games were of no consequence to the natives of India. It was in 1920 that Sir Dorabji Tata rushed in a team to the Olympic games at Antwerp - four athletes and two wrestlers. Thanks to that effort, Sir Dorabji was inducted into the International Olympic Committee. As a member of the IOC, Sir Dorabji made sure the selections for the 1924 Paris Olympic games were properly conducted, through the first Inter-State Athletic Meet at Delhi. The technical inputs for conducting the events was provided by Dr.A.G.Noehren who was then the Director of the YMCA. Thanks to the YMCA's School of Physical Education in Madras, Dr. Noehren knew what went into selecting athletes. The 1924 team had 8 athletes - and three of them were from Madras. It is likely that all of them trained at the Y's School of Physical Education, which has since become the College of Physical Education, with its campus at Nandanam. The Chennai connection with the Olympics continues. One of the medal winners at the 2012 London games - Gagan Narang - was born in Chennai, though he was a Hyderabad resident when he won the medal. Interestingly, the current President of the IOA, N. Ramachandran, is a Chennai resident. Maybe this year's Olympic games in Rio will see some medals coming to this city! The city of Madras, as we know, was initially just the space enclosed within the walls of Fort St George. As in any city, there were some parts which were more favoured as residential areas than others. The most favoured portion in the Fort was its south-eastern quarter. It was the furthest point from the Customs House, and so presumably far enough away for the smells of goods to not bother the residents; plus where the sea-breeze would blow through unhindered. The two streets in that quarter, running north-south, parallel to each other, are St Thomas Street and Church Street. Church Street is the more eastern of the two and therefore having less of a cachet. St Thomas Street was the favoured residential area, and the nine residences there - four on the eastern side and five along the western flank. These were built sometime in the early years of the 18th century. If you were a resident here, your neighbours would have been Majors, Colonels and members of the Council - and the chaplain of St Mary's Church. Most of those houses are gone, fallen to ruin. Others are well on their way there. 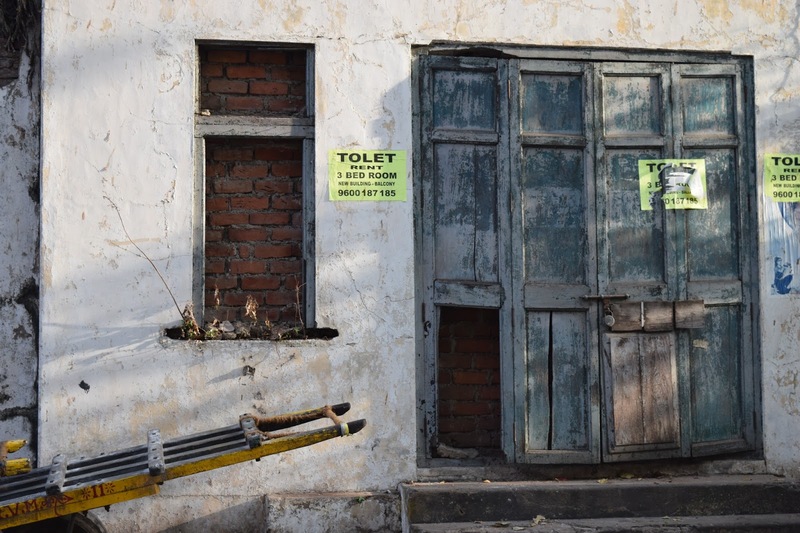 The ASI is gamely trying to do something about preserving these structures. This one - a large building that has its front door on St Thomas Street and its rear verandah on Church Street - would have been used both as a residence as well as a temporary storehouse for bales of cloth or barrels of wine as they were being traded into and out of the country. 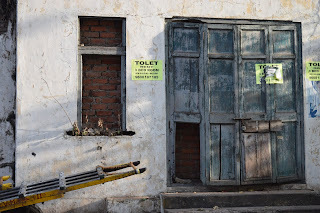 But today, it is barely able to stand up, a ghostly reminder of the glory that was once the "Snob's Alley" of Madras! A courtroom is not the first place that one thinks of when it comes to beauty. But beauty does make an appearance in all kinds of places, and a courtroom is no exception. This one is from the Madras High Court. It was a holiday for the Court and therefore it was easier to spot the stained glass on the lunette (I believe that's what it is called) above the door. 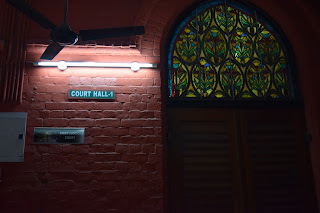 I think I would have been too captivated by the drama around the door - it leads to the Court Hall - 1, where the Chief Justice of the Madras High Court sits. You may also find it difficult to figure out the beauty of the lunette - the corridor is quite well shaded from the sun. And being a holiday, there was only the one tubelight along the way, distracting from the stained glass, as it were. But you don't have to take my word for it. Visit the Court and you will see not only this, but also beautifully tiled ceilings and other stained glasses - including a few over the CJ's seat! 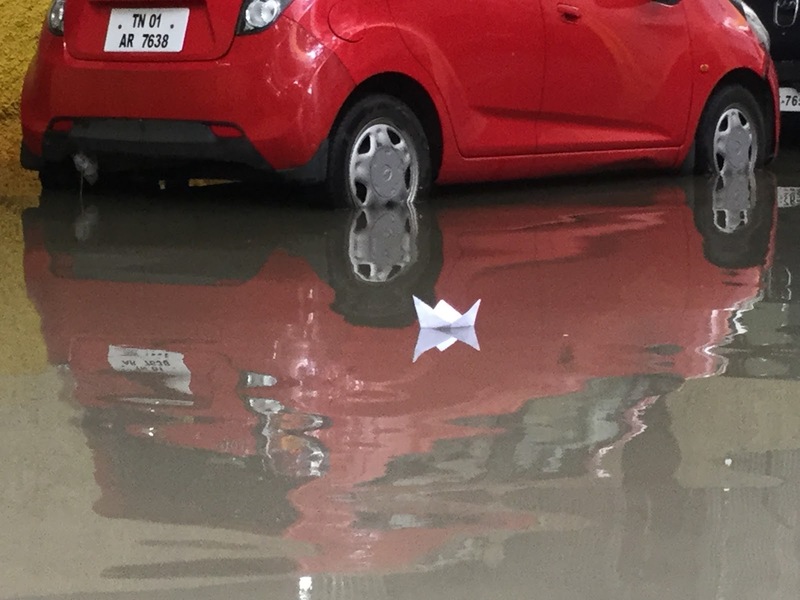 No, we haven't had more rains in Chennai. And no, it is not because I have been so traumatized by those rains in December. It is just that this picture seemed to be just right for today's Theme Day - Simplicity. What can be more simple than this paper boat? And what childhood joy can be more profound than getting wet in a gentle rain, while setting such boats out on their journeys? Tagore has written about them; Jagajit and Chitra Singh have sung about them - both works highly charged with simple emotions!